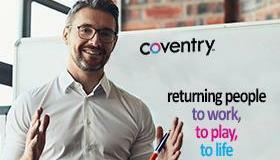 ﻿Coventry's products and services assist workers' compensation professionals in adapting to ever changing industry needs. Cost Projection Solutions help adjusters and nurses in setting ultimate probable cost of an injury/illness. They help address future medical, prescription drug and durable medical equipment needs for a defined segment of time from one year to lifetime expectancy. Our suite of services provide unbiased third-party comprehensive assessments, staffed by a national network of certified planners. We provide a variety of cost projection services tailored to fit your needs and the specific circumstances surrounding a claim. 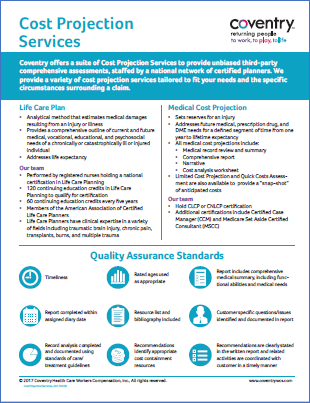 To learn more about Coventry's Cost Projections Services download our fact sheet . To make a referral contact our nationwide Cost Projection Team at NCSU_Fax@cvty.com or 888.348.3478.